In the end is my beginning…. Formed in 1992 to mark the 450th anniversary of the birth of Mary, Queen of Scots at Linlithgow, The Marie Stuart Society promotes further study of her life and times through research, lectures, activities and publications. Erected plaques at a number of different venues including Leith, Dumbarton, Carberry, Workington, Crail and Sheffield Manor. Planted a tree and plaque at Dundrennan Abbey. Financed the restoration of rare books in Lambeth Palace Library. Initiated an essay/poetry competition for primary schools throughout Scotland. 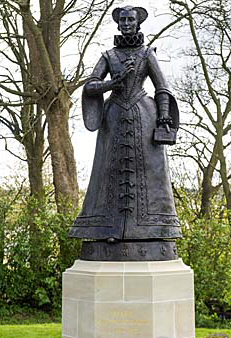 Recently we succeeded in raising sufficient funds to erect a statue of Mary at her birthplace, Linlithgow Palace – this was unveiled on 24 April 2015. The Little Book of Mary Queen of Scots by Society member Mickey Mayhew. Click image to purchase on Amazon. A Chronology compiled by Society Archivist Syd Whitehead. Click image to email for purchase details. The Captive Queen of England by Society member David Templeman. Click image to purchase on Amazon.